T-REX RECREATIONAL Portable by Bison, Inc.
GYMNASIUM QUALITY SYSTEM WITH A 54" GLASS BACKBOARD. Institutional Grade! The popular T-REX spring assisted portable line now comes in a size to fit any facility. Built for aggressive play and excellent playability at rec centers, practice facilities, multipurpose sports centers, church facilities or anywhere a durable, easy to set-up basketball system is needed. 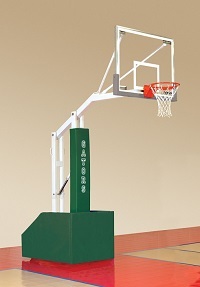 Rim height can be adjusted and locked in anywhere from 8' to 10' for youth league play. This portable is a great system, shop around and compare these features. BACKBOARD: 42" X 54" tempered glass backboard. The backboard has a lifetime warranty against breakage during dunking because the rim is bolted directly to the pole system and not to the backboard. You don't have to worry if someone hangs on the rim. Backboard extension is 54" from the base. Includes Dura-Skin bolt on backboard padding available in Black only (select above). Choose from 16 School Colors for Base and *Backboard Padding! *Only Black or Grey backboard padding is available for model with 54' backboard. PORTABLE BASE: Floor friendly 8" diameter x 2" wide casters make moving the system very easy by one person. Adjustable front leveling feet provide excellent stability in the playing position. Built in covered ballast allows for aggressive play without tipping. Includes 2" thick base front and side padding in your choice of 16 popular school colors. Black, Gray, Royal Blue, Scarlet,Navy Blue, Columbia Blue, Kelly Green, Gold, Forest Green,Orange, Purple, Maroon, Brown, Burnt Orange, Cardinal and Vegas Gold (select above). Padded base size is 40" wide and 65" long. Total storage dimensions are 58" wide X 124" long X 78" high. Designed to fit through a standard double door opening. ADJUSTMENT SYSTEM: Extension spring adjustment system makes for a 5 min. set up by one person. This no maintenance spring system is much better than leaky hydraulic systems used on other brands. Rim height adjusts anywhere between 8' and 10' for youth league play.